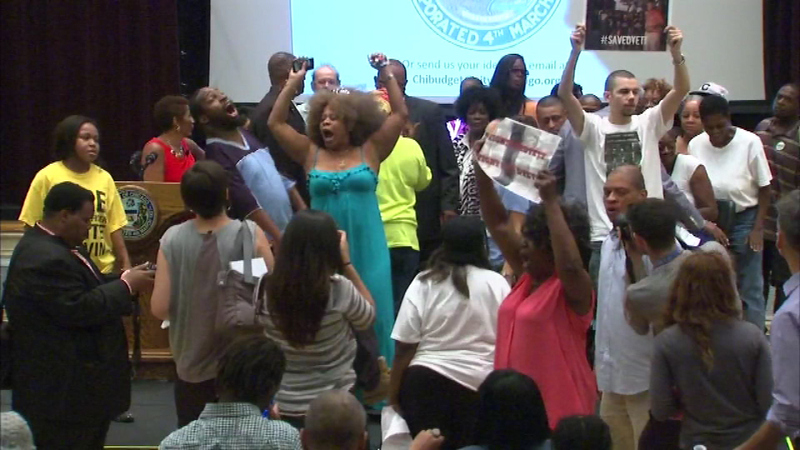 Protesters shut down the second public meeting hosted by Mayor Rahm Emanuel to address Chicago's budget crisis. CHICAGO (WLS) -- Tempers flared at the second meeting on Chicago's budget, held at the South Shore Cultural Center. Mayor Rahm Emanuel was ushered off the stage by police as protesters voiced their anger over the shutdown of Dyett High School. The meeting was the second public hearing on the city's budget, but ended early because protests got out of hand. The meeting comes as the Chicago Sun-Times reports the mayor will present a plan to raise property taxes by $500 million to help with the city's pension problems. Emanuel is expected to unveil the full budget later in September. The third and final public meeting will be held Thursday at Wright College.